Shipping is included in the cost of the game. Each game is individually signed and numbered by DARLENE. These games are over 30 years old and from the initial printing. 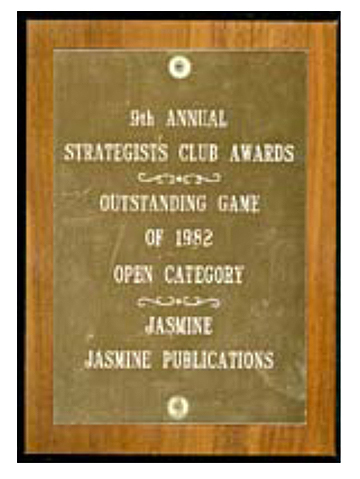 When The Dragon editors failed to renew her Jasmine saga for another year, DARLENE developed it into a game. Her card game sprang directly from the interactions of her characters. She sorted them into four factions, each possessing unique and different strengths and attributes. 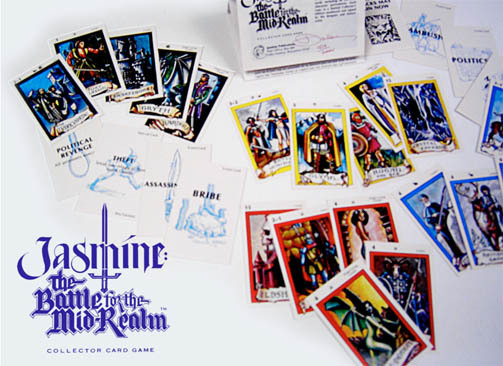 Since the card game was initially character-driven, it is natural for players to ad lib and assume the personae and traits of their faction during play. Jasmine: The Battle for The Mid-Realm™ collector card game officially marks the first appearance of a role-playing game using playing cards. DARLENE was the first to develop a card game system which defines three types of playing cards—faction cards, event cards, and special cards—each with unique actions which can change depending upon what other cards are in play or which factions are holding them. This is unique, then and now. Darlene lavished much attention on the details of the fantasy artwork for her collector card game. She illustrated all 112 playing cards. 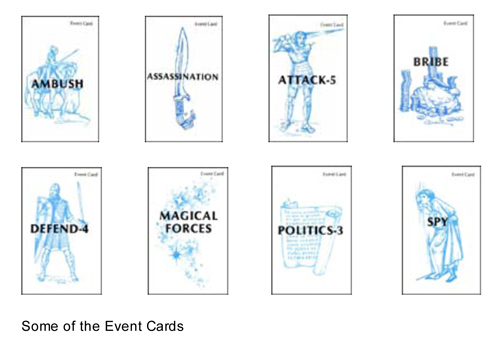 The event and special cards are printed in two colors. But for the Faction cards, Darlene created forty miniature portraiture paintings. Jasmine: The Battle for The Mid-Realm™ game is the first to combine card actions with full color paintings in the context of playing cards. (1) From May 1980 to May 1981, twelve episodes (17 panels) of Darlene’s illustrated fantasy-adventure, “The Story of Jasmine,” ran in The Dragon Magazine beginning with Issue #37. (2) Merle Rasmussen, “Fun Is In The Cards With JASMINE” THE DRAGON Magazine, TSR Periodicals (Lake Geneva, WI) January 1983.